"The Abe administration is composed of and supported by extreme rightists who are trying to rewrite history and glorify Japan’s aggressive war." August 15, 2015 -- Japanese Communist Party, posted at Links International Journal of Socialist Renewal -- Japanese Communist Party chair Shii Kazuo held a news conference on August 14 at the JCP head office in Tokyo, releasing a statement to mark the 70th anniversary since the end of World War II. In the statement, he criticised Prime Minister Abe Shinzo’s statement published on the same day as deceitful. The full text of the JCP statement is as follows. On the 70th anniversary since the end of World War II, the Japanese Communist Party offers its deepest condolences to all victims of the war of aggression and colonial rule by Japan’s militarism. Now Japan is standing at a historical crossroads between war and peace. The war-renouncing Article 9 of the Japanese Constitution is a treasure embraced by the Japanese people, which they wholly endorsed based on reflection over the past war and the war ravages. The JCP sincerely calls for all peace-loving people to unite in order to protect Article 9 and create a truly peaceful Japan in line with the article, beyond differences in thought, beliefs and political stances. Prime Minister Abe Shinzo’s statement released today contains some key words such as “aggression”, “colonial rule”, “remorse, and “apology”. His statement, however, avoids sharing the historical recognition of the 1995 Murayama Statement which clearly stated that Japan followed “a mistaken national policy” and damaged the people of many countries “through its colonial rule and aggression”. Abe also evaded using the words “remorse” and “apology” as his own, merely citing the successive governments’ statements using the same wording. Thus, the Abe Statement is full of deceit. It is the worst distortion of history that the prime minister’s statement claims that the outcome of the Russo-Japanese War (1904-1905) “gave encouragement to many people under colonial rule from Asia to Africa”. In actuality, Japan fought against Russia in an attempt to colonise the Korean Peninsula using coercion and armed force. The Abe Statement, which practically dismissed the Murayama Statement, will inevitably provoke severe criticism from inside and outside the country. At the root of this harmful statement lies the fact that the Abe administration is composed of and supported by extreme rightists who are trying to rewrite history and glorify Japan’s aggressive war. The post-war international order was built on the common understanding that the war launched by Japan, Germany and Italy was a war of aggression. It should be strictly pointed out that any person denying this fundamental recognition is unqualified to engage in world politics. The JCP strongly hopes that this year, which marks the 70th anniversary of the end of the war, will be a milestone towards bringing about “reconciliation and friendship” between Japan and other Asian countries. In order to achieve this, the JCP calls for the following five basic policies that the government of Japan should adopt. First, it should fully endorse the crux of both the Murayama Statement and the Kono Statement. It should take action befitting the spirit of these statements and decisively refute any claims against them. Second, the government of Japan should work to settle the issue regarding the wartime Japanese military “comfort women” system by offering an apology and compensation to victims so that they can regain their human dignity. Third, an official rule requiring at least the prime minister and all cabinet ministers to refrain from visiting the Yasukuni Shrine should be established because visits of national policymakers to the shrine amounts to declaring Japan’s past war as a just war. 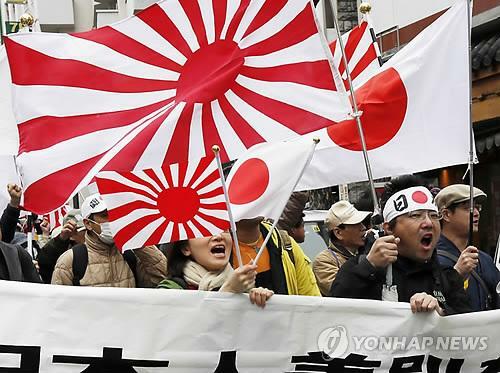 Fourth, to eradicate hate speech campaigns promoting ethnic discrimination, the government of Japan should take a firm stance, including legislating against such actions. Fifth, the government of Japan should sincerely and earnestly work to reflect in school textbooks the heart and soul of the Murayama Statement and the Kono Statement expressing deep remorse over Japan’s past mistakes. Mutual trust will be a foundation for building peace and stability in Northeast Asia. To win trust from neighbouring countries, Japan needs to confront its past history based on established facts, sincerely and earnestly admit to its mistakes, and learn from the lessons of the past for the better future. We are confident that only by doing so, Japan can earn trust in Northeast Asia. As the only political party that opposed Japan’s war of aggression and colonial rule at the risk of the lives of party members, the JCP will make its utmost effort to stop the backward current which distorts historical facts and to bring about “reconciliation and friendship” between Japan and other Asian countries. For these 70 years since the end of WWII, Japan has not directly engaged in war with other nations. The Japanese Self-Defense Forces (SDF) have not killed anyone of any country and no SDF members have been killed in war for more than half a century. Japan’s course as a peaceful nation has been ensured by the existence of Article 9 of the Japanese Constitution and the peace-seeking Japanese public’s strong voices and tenacious efforts. Bound by the peace-loving forces, successive cabinets have had to offer constitutional interpretations which refuse to regard the SDF as a military force and which ban Japan from using armed force abroad and the collective self-defence right. The Abe administration is trying to end the 70 years of Japan’s path as a peaceful nation, totally deny successive governments’ interpretation of the constitution, push forward with the war bills, and change Japan into a nation fighting wars abroad together with the US. However, in protest against this outrageous move to destroy the constitution, more and more people are raising their voices and standing up on an unprecedented scale. The power of the ongoing public movements is unparalleled in terms of their extent and depth. This shows how strong Japanese people’s enthusiasm for peace and democracy, which was created over the 70 years of post-war history, actually is. It is unforgivable to turn back the clock to an aggressive Japan whose people “kill other people or are ready to be killed abroad”. The JCP will work hard to further spread the joint struggles inside and outside the Diet [parliament] on the single task to “block the war bills”, encircle the Abe government with overwhelming public opposition, and kill the bills. The JCP has proposed “the initiative for peace and cooperation in Northeast Asia” with the aim of establishing peace and stability in the region. The party has continuously held dialogues with relevant nations to achieve this goal. The JCP believes that this plan protecting Japan’s security in a peaceful manner is the only viable counterproposal to the Abe government’s war bills. In order to realise this plan, the JCP will make full use of its brains and strength.